Togo goalkeeper Kossi Agassa has urged the country's football authority to put its house in order as the Hawks attempt to return to the Africa Cup of Nations. Despite boasting a large array of European-based players and reaching the quarter-finals in 2013, Togo failed to qualify for this year's tournament in Equatorial Guinea. And the highly experienced Agassa, 36, has warned that the country risks missing out again in 2017 unless a Fifa-endorsed normalisation committee, set up to run Togo's Football Federation (FTF), brings order to the administration of football in the West African country. 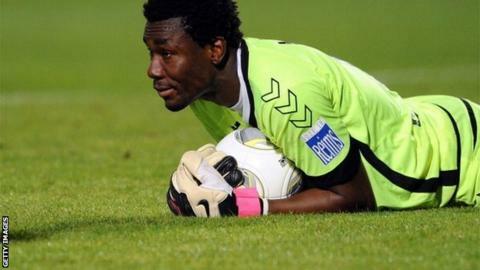 "Togo's problem is a deep one and it's all about the federation," Agassa told BBC Sport. "We have good players but we are always facing different problems within the federation. "Bringing success is not about the players but it also includes the football authority. "It will be impossible for us to talk about the team without focusing on the body in charge of organising and running the football. "If we all don't come together as one then we might just miss out on another great opportunity to play in Gabon in 2017." Togo reached their peak in 2006 by appearing at the World Cup in Germany. But the Hawks lost all three matches at the finals and made headlines for all the wrong reasons. Their German coach Otto Pfister resigned and then withdrew his resignation just three days before his team was to play their opening game. And a bonus row saw players threaten to pull out of the match against Switzerland but they were persuaded to play after an intervention by Fifa. Since then, Togo's fortunes have been on the wane. They failed to qualify for the Nations Cup in 2008 and 2012 and withdrew from the 2010 tournament after an attack on their team bus. Frequent coaching changes have not helped matters and their biggest star Emmanuel Adebayor often blames a lack of professionalism by officials for his frequent short-lived retirements from the national team. Togo are in Group A of the Nations Cup qualifiers alongside Tunisia, Liberia, Djibouti and Agassa, who played in all three World Cup matches in 2006, is wary of the challenges on and off the pitch. "It's a tough group and it will be a tough competition to come out of it," he added. "The reason we missed out of previous tournaments was the organisational problems. "Some players are unhappy with the set-up back home and if we don't get our acts together it will be another chaos. "Today we have a normalisation committee in place and are waiting for them to see which direction to go ahead of the qualifiers. "Of course, at my age I'd love to appear in another Nations Cup but it all depends on the set-up, if it's not organised then it will only just be a dream."